Welcome! You’ve landed at The Speech Room News. 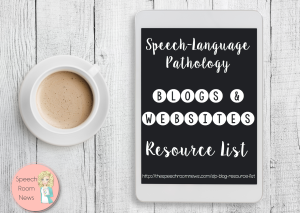 SRN is a speech therapy blog for speech-language pathologists and other educators. I use this space of the internet to share the news from my speech room to yours! I’m so glad you’ve found me! 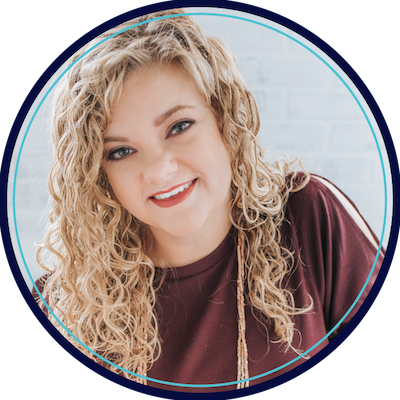 My name is Jenna Rayburn Kirk, M.A.,CCC-SLP. I’m an ASHA certified pediatric speech-language pathologist. I work in the Columbus, Ohio area. I’m a graduate of The Ohio State University and Ohio University. My clinical experience has focused on pediatric speech and language therapy. I’ve worked with children aged 2-15 in schools and clinics. My current interest is in preschool-aged children. I work in a public school full-time in central Ohio. When I’m not rocking life as an SLP, you’ll find me with my husband, Scott, and our two dogs. I’m totally an accidental entrepreneur! I started writing about speech therapy in 2011. From the beginning, my goal has been to connect with other professionals and to share what’s happening in my daily grind. Well, maybe not EVERYTHING. I try to share what works well! You can see my #SLPfails on Instagram though! Shortly after I got started, SRN turned from a hobby into a business. I realized I could take my passion for working with special needs children, my passion for problem solving, and my passion for crafting and make my own speech therapy materials. Like all passion projects, this one didn’t start as a business to make money. It started because I love to share, collaborate, and learn. Now that SRN is such a big part of my life, I’m happy to consider it not only my passion but a full-time job. So, what will you find here on The Speech Room News? News and ideas straight from my speech room. Actually, my speech cart. I do all my services on an inclusion model and haul my life around in a rolling cart! I hope you find inspiration to try a different approach with a difficult client. I hope you find inspiration to ditch the worksheets and do something fun with a client. I hope I can save you hours of planning time so you can go do something that YOU are passionate about.Follow along on social media to keep up with life around here! Looking forward to more great posts! Congratulations! Lovely Jenna,looks so clean and organized! Looking forward to lotsa stuff and good ideas. Your website looks great! 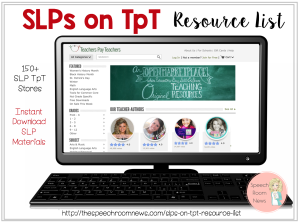 I love your website, and ideas for speech-language therapy! I am currently in graduate school for this field and I think they will be very helpful! Thank you so much! so glad a friend sent me a pin from your page, my toddler will be 3 in Dec. He has been getting help from a speech therapist since feb. We have had a lot of progress and still a lot to go. He also showed earlier indications for Autism spectrum disorder but that has since been ruled out. I enjoy finding resources that will help our family help him thrive. I am a Mentor Teacher/Reading Support for my school and many of your ideas for 4th-5th grade elementary classes have been successfully used in the classroom. We are an inclusive school and the activities are both helpful and fun. Thank you! I look forward to some new ideas! I LOVE your therapy ideas/ materials. Any therapy material ideas for teenagers with significant mental health challenges. Anything giddy/ light hearted/ easy to do that they d enjoy. I m thinking if some clients who like writing /colouring/ comic strip humour. I really love all of your ideas! You have been a great resource to me and I’m so glad that I found you! My co-workers and I talk about you like we know you personally! I just wanted to say thanks for all that you do! Thank you for all the great info. I am in grad school right now and I will be done in a year and half. I am looking forward to working with kids. Loved your Scheduling 101 info for beginners. I hear the 1st year out of grad school is the toughest, so any info us newbies can get in advance is GREAT!!! Thanks! Goodluck with your last two years! Thanks for all your ideas and materials. My colleagues and I all love the designs – so new and fresh! Jenna, I have been purchasing a number of your interactive books. I am wondering how you are storing your books? I am trying to figure out the best way to store them. Any ideas will be welcomed!! I just discovered your website. It is soooooo good. I am looking for social thinking tools for my family. I will be purchasing some products from TpT. You are great at this!!!! Thanks for the hands-on resources. 🙂 For sure! Coming to 16 backpacks near you really soon. Thanks so much for all the freebies and your blog! I’m a Speech/Language Pathologist for Los Angeles Unified School District. During the school year, I’m a LAS Assessor for LAUSD’s Non-Public Schools and in the summer months I work for LAUSD’s Preschool assessing 2 to 3 year olds for Speech and Language.. And, working in Los Angeles, I certainly can use all the LAS freebies I can get my hands on. I work in public schools and love all your ideas. I’m always looking for new ideas especially targeted towards children with multiple disabilities. I’m an SLP who has spent 10 years on the medical side of speech therapy in acute rehab. However, I’m looking for a change and now have two school-aged children. I’ve recently interviewed for an opening with their school district and used your “interviewing 101 for CFs” questions to prepare – AND THE QUESTIONS WERE ALMOST IDENTICAL! I was so shocked (and thankful I’d found you!) I’m in Texas, so we haven’t adopted common core, but almost every other question was asked and I felt so prepared. I’ve also enjoyed reading through so much of your content and feel like I’ll have the confidence to take on the new position (which will really be like changing careers for me) should I get the job. I also plan to take your course on school-based practice so I’ll be ready come Fall. Thanks so much for your time and effort on this site – it’s been a lifesaver to me!